Design and manage clinical research with more control, convenience and confidence than ever before. Work for IBM Clinical Development? Learning about IBM Clinical Development? "IBM Clinical Development is the One to Use"
We've used several different platforms in our business and have found IBM Clinical Development to be the best based on ease of use, reliability and flexibility. There is nothing to dislike about IBM Clinical Development (except maybe the initial cost? But it's well worth the price in the medium and long run). What Electronic Data Capture (EDC) solution do you use? REDCap (Research Electronic Data Capture) is a secure web application for building and managing online surveys and databases. 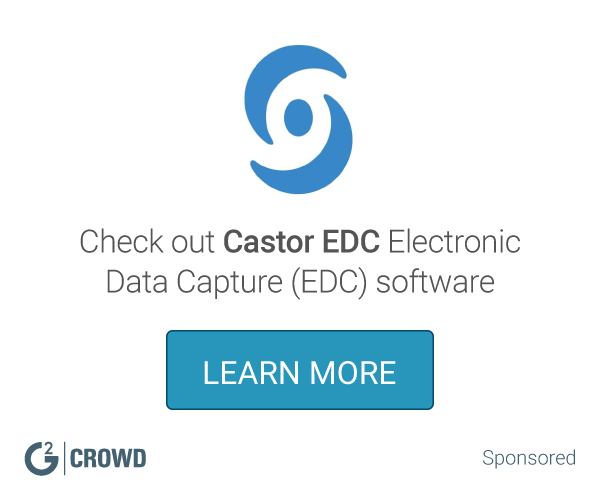 Castor EDC is a mobile-friendly electronic data capture system for clinical trials. Features include audit trails, user management, form building, randomisation, remote capture (patient surveys) and more. MATRIX EDC is a cloud-based clinical data management application. EDC supports electronic, paper-based or hybrid studies. Medrio offers an integrated eClinical Software as a Service (SaaS) platform with a fully hosted Electronic Data Capture (EDC) system that drastically reduces study timelines and costs by putting study managers in control of their studies. Medidata Rave is a cloud–based clinical data management system used to electronically capture, manage, and report clinical research data. It enables the user to record patient information (ie, visit, lab, and adverse event data) using forms that are customized for each study. Provides integrated solutions to automate Electronic Data Capture, Data Management, and Project Management needs. Clireo eTMF is supported by a complete cloud-based document management system to facilitate any eTMF business process. Clireo eTMF includes inspector portal, workflow, version control, document staging areas, FTP connectivity, and a full standards-based API. Easily add Clireo eCTD for global regulatory e-submissions. Dacima Clinical is an advance electronic data capture (EDC) and clinical data management system (CDMS) for capturing, managing and reporting clinical research data and optimizing data collection by efficiently streamlining clinical data collection process. Web based SaaS EDC solution for clinical trial management. Features include compliance, data export, and medical coding. Catchtrial offers special functionalities and flexible personalization for unprecedented ease of data management. * We monitor all IBM Clinical Development reviews to prevent fraudulent reviews and keep review quality high. We do not post reviews by company employees or direct competitors. Validated reviews require the user to submit a screenshot of the product containing their user ID, in order to verify a user is an actual user of the product. Hi there! Are you looking to implement a solution like IBM Clinical Development?